“The Phantom Of the Opera” (Theater Phantom / Opera Phantom / Opera Phantom) is one of the masterpieces of the musical master Andrew Lloyd Webber, with wonderful music, romantic plot, perfect dance, become a eternal masterpiece in music opera. It is adapted from the French writer Gaston Louis Alfred Le Lu’s Gothic novels of the same name. In an opera house in Paris, strange things happen frequently, the original chief actress was almost killed, the theater appeared a creepy fantasy male voice. The voice came from the “ghost” living in the labyrinth of the theater, he fell in love with actress Christine, secretly taught her to sing, to help her get the heroine position, and Kristin was in love with the theater agent Rau Seoul, which caused a series of jealousy, chase, murder and so on. The final “ghost” found himself love for Kristin more than the personal possessive, so the liberation of Kristin, leaving the cloak and mask, disappeared alone in the dark underground maze. In order to commemorate the film, some fans customized peripheral products ,lapel pins to GS-JJ, enamel pin maker. GS-JJ can provide you the best productions according your requirements. 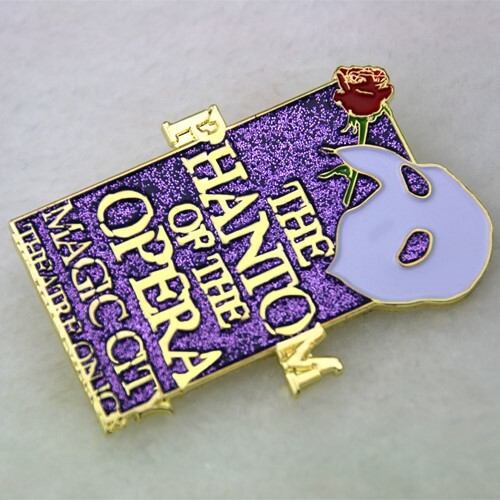 The custom lapel pins for opera of phantom, made by GS-JJ. It is crafted by soft enamel and covered by purple glitter, die struck with gold finish. 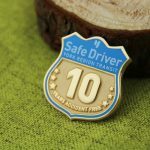 Soft enamel pin is one of our most popular style. Metal areas are raised, colors are recessed. The color is uniform ,exquisite workmanship. Each of us is individually poly bagged and fixed by two butterfly clutches back.GS-JJ can provide many different soft enamel pins at the lowest price. wvbfwxk,Waw! Its really great and wonderful ever i found. Thank you for sharing this info.